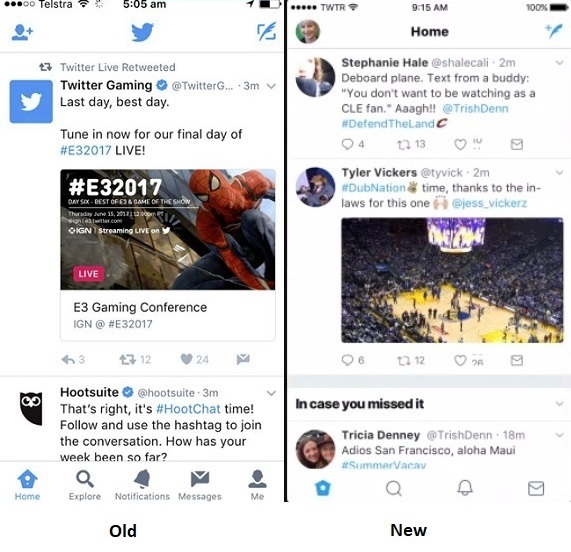 As you may have already noticed, Twitter has unveiled a fairly significant redesign today, maybe the biggest in the app's history. And while the majority of the changes are purely aesthetic, there are some interesting side notes and tools to be aware of in the new layout - here's a complete overview of the differences. First off, there's the layout changes - here's the old and new Twitter app looks (on iOS) side-by-side for comparison. As you can see, there are a quite a few tweaks - here's the same comparison, with additional notes to highlight the changes. The rounded icons will probably stand out the most when you first log on - and worth noting too, this new design is present on all versions of the app, iOS, Android and desktop. Part of the motivation behind the update was to make Twitter look more uniform across all versions, and these changes bring the iOS version more into line with the Android app. 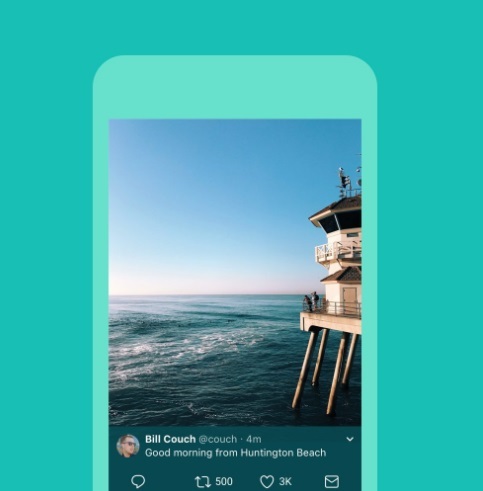 On the rounded images - Twitter says that they've re-designed the look of their visual elements to improve the layout of the app. And already that change has caused some headaches. This is definitely worth noting for your brand presence - the new layout will change the way your profile images look. 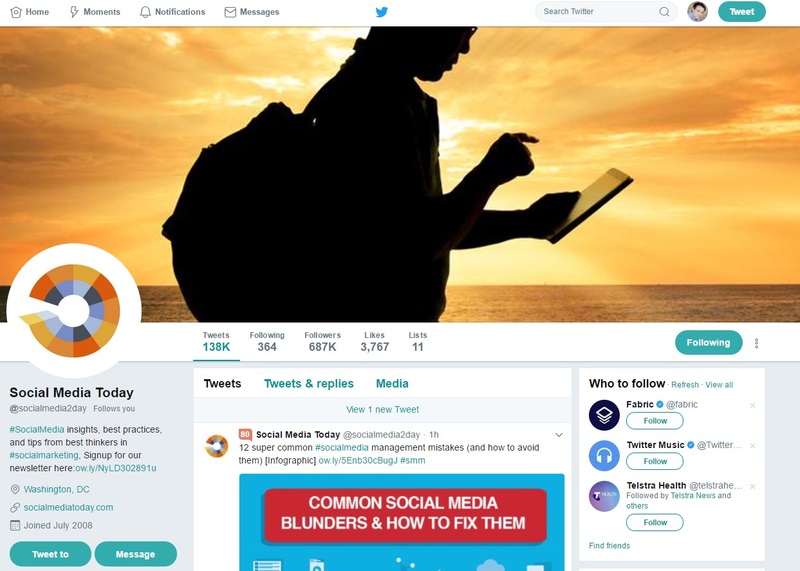 Once you have access to the new layout (it's being rolled out now), it's worth taking a look at your Twitter profile to ensure it looks how you want it to in the new format, and that your visuals align with the rounded presentation. 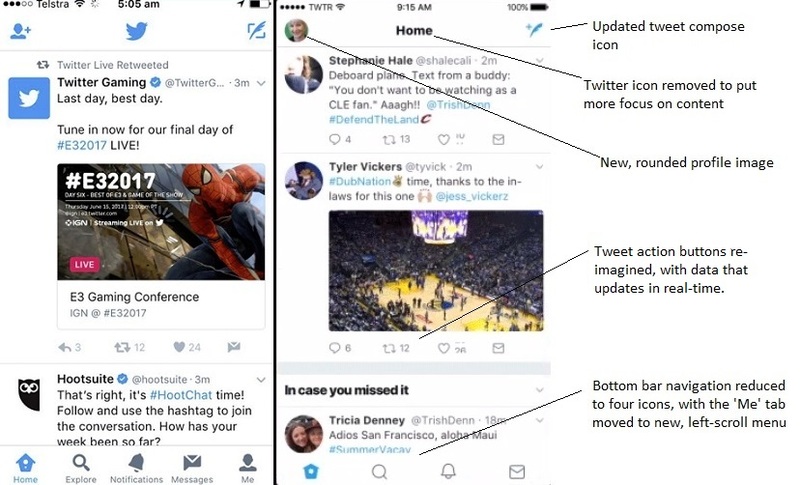 In addition to the more rounded look, Twitter have also updated their fonts to further refine their presentation. Photos also look different - when viewing an image in the Twitter photo-viewer, the background color is now based on the dominant color in the photo. 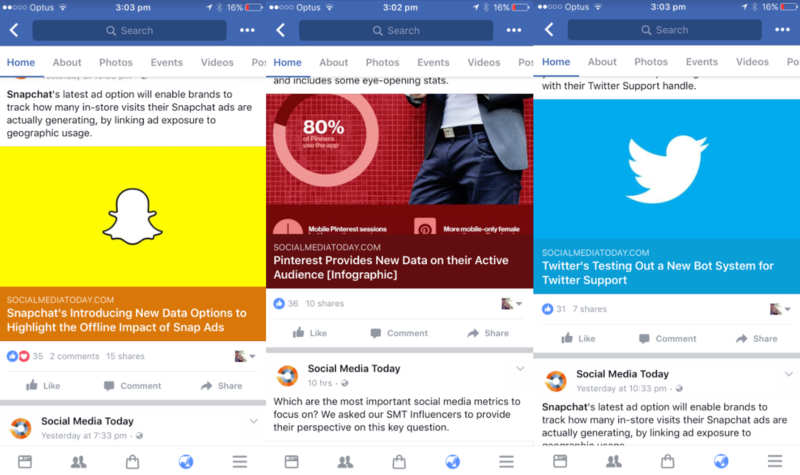 Interestingly, Facebook has also been experimenting with similar, with a recent test changing the background color of link preview text to the dominant color of the link image. 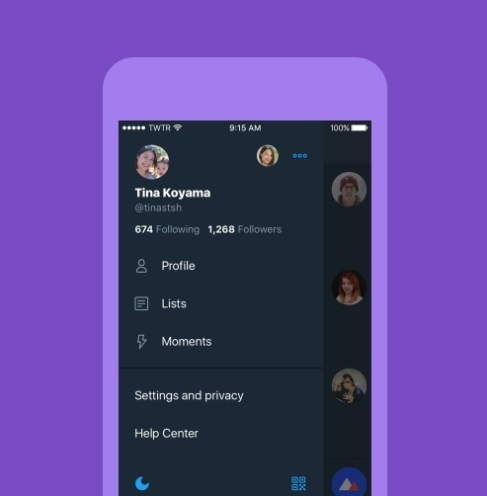 In terms of the new option for the 'Me' tab, Twitter's added a new control panel, accessible by swiping left, which includes a range of personalization options. As you can see, you can access your profile info, additional accounts, settings, privacy, Moments, and Lists - while there's also a new shortcut for night mode. This builds upon similar changes added to Android last June, bringing the functionality across to iOS. Building on available functionality within the later versions of the respective operating systems, Twitter's incorporated some new options to make it easier to access relevant tools and services quickly. Also, as noted, tweet activity now updates in real time, so you can watch your tweet engagement flow through as it happens. There's also a high-contrast mode to help visually impaired users, specifically updated icons for replies and retweets (Twitter says that new users sometimes confused the 'arrow' reply icon as meaning 'delete' or 'go back'- so they changed it to a speech bubble) and various other smaller tweaks throughout the app. Twitter's also changed the way links are accessed within the iOS app - now, when you click on a link within Twitter, it'll open within Apple's Safari View Controller, which will enable users to access content using their saved passwords within Safari. So if you have a subscription to a publication, and you're logged in on your phone, you won't need to re-enter the log-in details if you access a link through Twitter. "Safari View Controller also makes it easier to view web pages within apps without ads. People can switch to Safari's Instapaper-style Reader mode, which eliminates ads from a page, and Twitter is giving people the option to set the app to always open links using Reader mode. And since Apple's Safari View Controller began supporting mobile ad blockers in 2015, people who have installed and activated a content-blocking app on their iPhones and/or iPads can have that app remove or disable ads, cookies, autoplay videos and other elements from web pages opened using Twitter's in-app browser." This is an interesting consideration - it may seem like a minor move, to change the way links are opened, but it could have significant impacts. Also worth noting, the new changes also flow through to TweetDeck, which has announced another small - but relevant - update on their side. This is definitely an interesting addition for those who use lists, giving users new capacity to use lists as a sorting device, adding people to a group which could be later used as a custom audience or to refine and share with others. Basically, there's a heap of changes, some of which are minor, and others which may be more relevant than they seem. It's difficult to understand the full implications of each at this stage - and many users will have strong opinions both ways - but as you go about your Twitter process, you'll no doubt come to terms with the functional updates and shifts, and learn which work to your benefit (or not). From a marketing perspective, as noted, the key element to check off is to ensure your profile looks how you want it to in the new layout. Make sure you check out your profile - on desktop and mobile - from your audience's perspective and update as required to ensure you're making best use of the new layout and features. On first impression, the changes look good, and definitely seem to make better use of the available space and functionality, but as noted, it'll take some time and testing to measure the true impacts.